I’ve been settling into working at Banting House and time is already flying by! This week I’ve been working with our educational and children’s programming to make sure it is both fun and accessible for kids. I’m working on updating our scavenger hunt in a way that gets kids excited about going through the museum, but also in a way that is engaging and interactive for them. I’ve still been preparing to give a tour and I’m excited to have the chance to be an interpreter here! One of my favourite things about working at Banting House so far is seeing visitors coming from around the world and learning something new about Banting and the history behind insulin.. I’m looking forward to have the chance to really surprise people with what we have here. I think having a chance to give in depth tours is a great way to get people involved and thinking and questioning what they learn here, which is such a big part of bringing history to the community. I’ve also been learning more about working with collections, which means I get to explore the vast amount of records we have concerning Banting’s life and research. I’m still getting familiar with the technology and the process of organizing collections, but I’ve been having a lot of fun seeing the wide range of objects, photographs, and documents that we have here. From articles discussing the development of insulin to personal photos of Banting with his wives, you can really get a full scope of his life and work. We use the PastPerfect program to organize our collections, and I’m amazed by the amount of care and detail that goes into documenting every item. 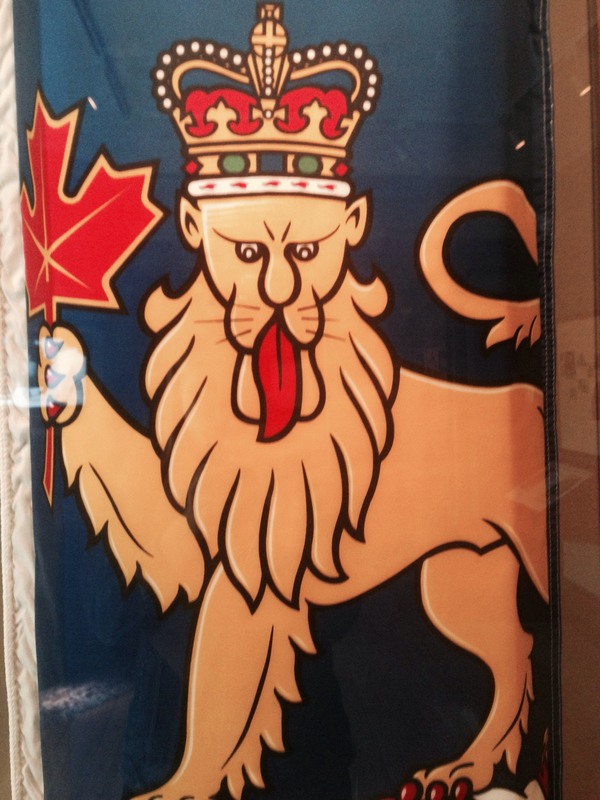 The Governor General’s flag, donated by Roméo LeBlanc in 1999, when Banting House received its National Historic Sites Plaque. One of the main projects I will be undertaking is doing inventory of the Seneshen Gallery, which showcases significant events that have happened at Banting House NHS. One of the most notable events hosted by Banting House is the visit from Her Majesty Queen Elizabeth the Queen Mother as she ignited the eternal flame in the gardens in front of the house. From the guest book from the Queen’s 1989 visit to Banting personal awards and artwork, it’s exciting to see all the objects that are associated with Banting House being recognized as a National Historic Site. This weekend is also Doors Open London, which I will be volunteering at. I think it’s a great opportunity to showcase our community’s local history and I hope to see many people visiting!